I’ve got weird feet. Those big toes look enormous! 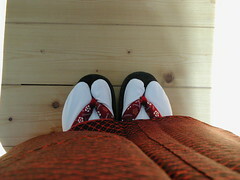 The kimono is an orangey komon, with a print that mimics shibori. It’s quite pretty, but oh-so-orange. This kimono fits a lot better than my other two. For one, it’s long enough to have a decent waist-fold. Plus, the sleeves are almost long enough to touch my wrists, if I tuck my elbows in a little. I don’t think I’m any taller than the average Japanese woman, but I must be descended from orang utans (very likely in my neck of the woods), ‘cos the sleeves are all too short for me. 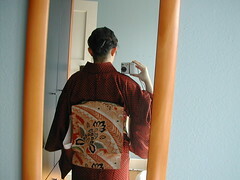 This seems to be a common phenomenon for vintage kimonos. Since learning a little more about kitsuke, I’ve decided to be more discerning when bidding for items on ebay. I’ve been trying to perfect a search string to pull up kimonos with long-enough sleeves, but because some people publish in inches, I’m bound to miss quite a few out. Oh well, I guess a slow and painful trawl through the better merchants will have to do.